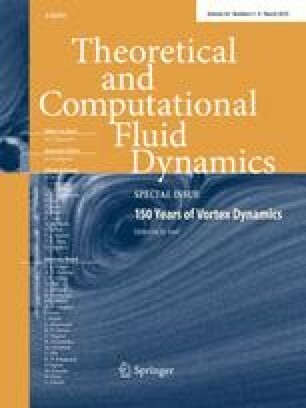 In this paper examples are given of the importance of flow separation for fluid patterns at moderate Reynolds numbers—both in the stationary and in the time-dependent domain. In the case of circular hydraulic jumps, it has been shown recently that it is possible to generalise the Prandtl–Kármán–Pohlhausen approach to stationary boundary layers with free surfaces going through separation, and thus obtain a quantitative theory of the simplest type of hydraulic jump, where a single separation vortex is present outside the jump. A second type of jump, where an additional roller appears at the surface, cannot be captured by this approach and has not been given an adequate theoretical description. Such a model is needed to describe “polygonal” hydraulic jumps, which occur by spontaneous symmetry breaking of the latter state. Time-dependent separation is of importance in the formation of sand ripples under oscillatory flow, where the separation vortices become very strong. In this case no simple theory exists for the determination of the location and strengths of separation vortices over a wavy bottom of arbitrary profile. We have, however, recently suggested an amplitude equation describing the long-time evolution of the sand ripple pattern, which has the surprising features that it breaks the local sand conservation and has long-range interaction, features that can be underpinned by experiments. Very similar vortex dynamics takes place around oscillating structures such as wings and fins. Here, we present results for the vortex patterns behind a flapping foil in a flowing soap film, which shows the interaction and competition between the vortices shed from the round leading edge (like the von Kármán vortex street) and those created at the sharp trailing edge.